John McClain is the newest member to join the Armscor / Rock Island Armory team. John has already made the jump into the pro series and is competing this year. Known for his wild and crazy pants, John began making waves in the competition shooting world in 2012 when he placed for the first time at Multi-Gun Nationals. Since then, he has won several others, including Area 1, Area 2, and Back-to-Back titles at the USPSA Limited and Limited 10 Handgun Nationals. He has no intentions of becoming complacent, and has made it a personal mission and goal to be known as one of the top ranked shooters in the world. 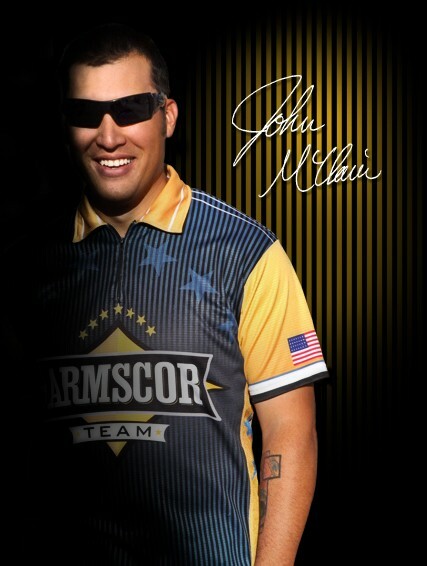 John is currently training and preparing to compete in the 3 Gun Nation Semi-Pro Tour with the 3 Gun Nation Pro Tour set in his sights. John proudly shoots Armscor ammunition, and is using a Rock Island Armory TCM/9mm High Capacity handgun for Multi-Gun.